Fig. 21 An example Interactive App that launches a desktop on the Owens cluster at the Ohio Supercomputer Center. 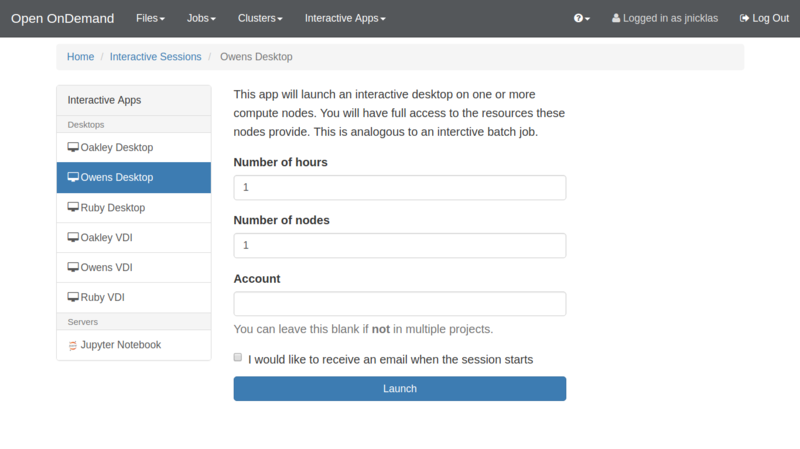 Interactive Apps provide a means for a user to launch and connect to an interactive batch job running a local web server (called Interactive App sessions) through the OnDemand portal (e.g., VNC server, Jupyter Notebook server, RStudio server, COMSOL server). They are considered Dashboard App Plugins and not Passenger apps such as the Dashboard App, Shell App, Files App, and etc. This means that the Dashboard is responsible for building the Interactive App’s web form, submitting the batch job, and displaying connection information to the user for a running Interactive App session. To get started it is recommended that an administrator walks through Enable Interactive Desktop at least once for your Open OnDemand portal. This will ensure your Open OnDemand portal is properly configured to host Interactive Apps.